Eastbourne . . . the place for sun, fun and a run . . .
Steeped in fascinating history, rich in natural splendour and surrounded by woodlands and countryside suitable for picnics, with plenty of hiking trails, cycling paths and magnificent countrified locations - not to mention the 4 miles of clean beaches and warm sea - there is something for absolutely everyone in Eastbourne, East Sussex, which is situated in the South East of England. 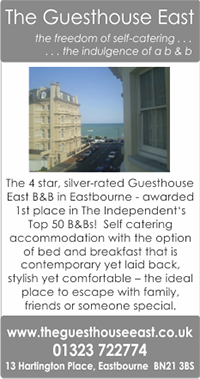 Voted the best summer town in the UK, Eastbourne is the sunniest town in Great Britain and an award winning holiday destination, the perfect place to unwind and enjoy time out or a holiday by the sea, in the stunningly beautiful and picturesque Sussex countryside. Classified as a large town, Eastbourne offers stunning views of the English Channel and local countryside from atop the Beachy Head cliffs at the eastern end of the South Downs. Local facilities include two cinemas, four theatres, numerous parks, a bandstand, pier, art galleries and several museums. There are numerous bars, pubs, restaurants and night clubs to enjoy locally. 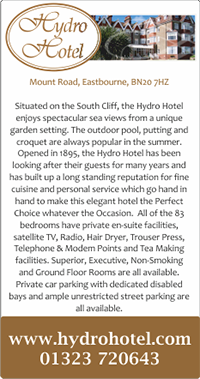 The award winning Waterfront complex can be found at Sovereign Harbour in Eastbourne. Enjoy the bars and restaurants, shops and cafes in northern Europe's largest composite marina complex which boasts four linked harbours, a large FREE car park. Boat tours and charters also operate from Sovereign Harbour, which is located at the Eastern end of Eastbourne. 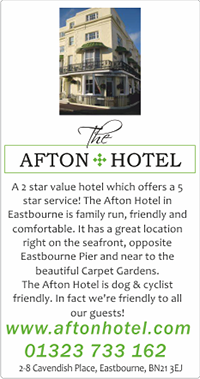 Whilst sadly we cannot guarantee sunshine for the Half Marathon weekend - you will however find a very warm welcome in Eastbourne and especially at the below recommended hotels, whose proprietors are all very keen supporters of the Eastbourne Half Marathon. Click on each to go to their websites.